Q: What inspired you – and who encouraged you – to become an entrepreneur? 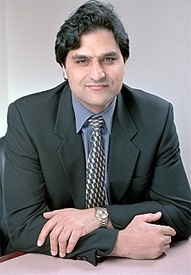 Dr. Rahul Razdan: As the founder of Ocoos, which provides a variety of high-quality business-to-business services to mid-size companies worldwide, my entrepreneurial drive – this union, to borrow the words of Steve Jobs, of technology married with liberal arts, married with humanities – enables me to combine my technical skills as a computer scientist with my enterprising spirit for launching (and building) companies of exceptional quality and value. The source of my drive involves the central concept of creation: Creation of a product, creation of a company, creation of value and creation of delight in the hearts of our customers. When it works, this outcome is a very satisfying way of life. Q: What have been the greatest challenges in being your own boss? And what have been the greatest triumphs? Dr. Rahul Razdan: When you are your own boss, the biggest challenge is that you have all the responsibility for the health of your business; and there is a very direct impact of your decisions on the lives of clients. In fact, the impact is often to the people with whom you have very close relationships. This can be a very lonely situation. In all the startups that I have run, I can cite situations where the direction of the startup was very much in question. Management is quite a challenge. The greatest triumphs are the situations where, despite all the challenges, there is success. The struggle makes the success all the more meaningful. With Ocoos, we have had our share of challenges, but we are now fortunate to see some significant success. In the process, we delight customers to the point that they send us gifts. In fact, today, we got chocolates from a customer in Hawaii. Q: What does it take for those seeking to start a business to be successful? Dr. Rahul Razdan: Discipline and vision are indispensable. Pushing forward when success is not clear with enthusiasm. So, too, is the importance of having a distinctive voice. For example: Marketing is substance – news you can use – written with style. And yet, most businesses offer an echo of the same generic content; they regurgitate corporate blather that is indistinguishable from one industry to the next; they say and write about the ordinary with the false belief that their words are extraordinary. I return, therefore, to my initial response. That is, an entrepreneur must stand apart by standing up – and speaking out – for the principles he or she holds sacred. Q: What advice would you give to people seeking to start their own businesses? Dr. Rahul Razdan: Follow your heart without ignoring your head. Translation: Be passionate about your business, but be reasonable about the reaction from consumers. A business only evolves into a brand through those things we can influence, such as messaging, marketing and service, as opposed to that singular variable no one can control, which is time.